Pivetta (2-1) picked up the win in Tuesday's 14-3 rout of the Mets, allowing three runs on seven hits and three walks over five innings while striking out two. 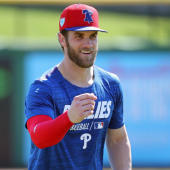 The right-hander was far from sharp, throwing only 59 of 100 pitches for strikes and serving up two homers, but a 10-run first inning by the Phillies gave Pivetta all the cushion he could have wanted. Despite the winning record, he sports a rough 8.35 ERA through four starts and 18.1 innings, and Pivetta's numbers may not improve any time soon -- his next start comes Sunday in Coors Field.